We'll get a higher res version of this, but I just got a snapshot of the picture that the Zeppelin Luftschifftechnik engineers taped to the inside of the main door. 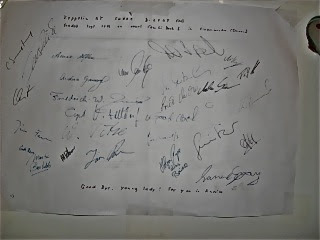 They all signed it on departure from Europe. It ends "Goodbye young lady, see you in America." And thanks to fair winds and a steady ship, they have indeed. Ok, I'll admit to not having dry eyes when I saw this..